In the decades after his death in 1959, Lester Young has been the subject of many published pages, both research and memoir, by Frank Buchmann-Moller, Lewis Porter, Douglas Henry Daniels, Whitney Balliett — as well as anecdotes that continue to crop up even now (even on Facebook). One would think that there was no need for more writing on the subject, especially since Lester’s life seems to fall in to clearly discernable and well-documented acts in his own play: his childhood experiences in the Young family band; early exposure to Bix Beiderbecke and Frank Trumbauer; professional gigs with King Oliver, Fletcher Henderson, and then his glorious time in the Count Basie orchestra; small group work with Billie Holiday; his attempts to lead his own small groups; his unhappy time in the United States military; increasing fame balanced against ill-health and a feeling of being overwhelmed by people copying him; his brief final decline and early death. Would another book on Lester would be superfluous, or it would provide the same stories with new prose connecting them? There are some writers I read with difficulty because their prose is efficient but graceless ways; others are so ornate that meaning gets submerged. I can tolerate either or both if the chosen subject is appealing. But Gelly is that rare creation: a subtle writer, not in love with the sound of his own rhetorical flourishes, whose work is a pleasure to read for its own sake. Add that he is writing about one of my heroes: this book couldn’t be better. In fact, when I first received a copy of this slim volume — slightly over 170 pages — I put myself on a reader’s diet, putting the book out of sight after each chapter so that I wouldn’t finish it too quickly, wouldn’t get to Lester’s sad end too fast. Gelly handles the facts with grace, but his is not simply a compact retelling of what Buchmann-Moller and Daniels have done more expansively. His book is thoroughly adult in his emotional relation to his subject. He clearly loves Lester, but can at points step back and gently say that a career choice was not something that served Prez well. So his admiration and adoration are fair and moderated by kindness. When some writers depict a subject who has, let us say, cut his life short by alcohol or drugs, there is a constant soundtrack of quiet parental disapproval. The word SHOULD hangs over the book. “Oh, if _____ had only done this, he would be with us today,” as if the writer is trying to hide his annoyance that the subject didn’t live longer, record more, give us more pleasure. Much has been written about the estimable personal qualities of Willis Handy Young — his unwavering devotion to study and self-advancement, his grim determination to succeed against the odds, his considerable musical gifts, his talent for administration and his dignified conduct under the barely tolerable yoke of Southern racism. But among all these splendid qualities at least one attribute was plainly missing — a tender heart. To take a child away from its mother by means of a trick is a wicked thing to do. When that child is a shy, sensitive little boy with a deep mutual attachment to his mother, it is unforgivable. According to Irma, Lester wept bitterly for a long time afterwards. No doubt Lizetta wept, too. That passage — on page four — so struck me that I sought out the Beloved to read it to her. “Wicked” is not a word we use often in this century, but a biographer with righteous indignation, a moral sense, and a tender heart is a rare artist indeed. 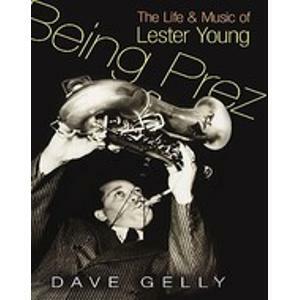 BEING PREZ also has one great and endearing advantage over any other book on Lester: Gelly is a professional jazz musician whose instrument is the tenor saxophone. And he is humanely articulate about that instrument and what it requires. We aren’t barraged by a Schuller-styled musicological analysis of what Lester is doing (did you hear his implied Db diminished thirteenth over the grace note in the last beat of bar 127?) which makes those who aren’t grounded in music theory turn pale and opt for a newspaper instead, but Gelly conveys certain information about the mechanics of what Lester does better than anyone else I’ve ever read, without intimidating or overwhelming the reader. His musical analyses are brief but convincing, and his explanations of how Lester got certain sounds make what was once completely mysterious clear. Finally, Gelly does a superb job of balancing his narrative between the two selves: Lester the quiet, tender man who often wants simply to play among congenial souls and then to be left alone in solitude, and Lester the musician who amazes and continues to amaze. Gelly’s aims in this book are noble yet simple — free from a particular ideological slant. He says in his introduction that he took on this book because Lester was always fragmented in this way, and that he wanted to do what he could to bring this elusive, enigmatic man to light. He’s succeeded. Gelly is not combative, but he is somewhat impatient with the teetering myths of Lester’s life — for one, that Lester was so broken by his army experience that he couldn’t create (many recordings give the lie to that) and that he was so downtrodden by his imitators that he despaired. Other biographies of Lester have their own delights: first-hand testimony from musicians who played alongside Lester, or extensive data on Lester’s childhood. But BEING PREZ is as beautifully and completely realized as any long solo Lester ever created, and I wait with eagerness for whatever Gelly will write in future. Lester once told pianist Horace Silver (he spoke of himself in the third person), “I just don’t feel like nobody likes old Prez.” BEING PREZ, had he known of it, would have made him feel better. “Bells!” indeed. Today would have been Lester Young’s one-hundredth birthday. His centenarybecame a media event weeks ago. Smithsonian Magazine and the Wall Street Journal carried articles celebrating Lester’s life and art; Ted Gioia has written what looks like a fine book proposing that everything that was once outsider cutlure, “hip,” “cool,” the property of only a few trend-setters, originated with Pres. Online, there are sites devoted to the occasion (I could send someone a Pres e-card this morning, or I could subscribe to a jazz video site that promises me a new one emailed every day). All these celebrations seem good omens that our culture, typically ignorant or dismissive of jazz, is paying attention to a heroic figure. Would the attention have pleased Lester? I hope so. I have in my mind’s eye the account of a birthday party given in his honor at Birdland in the Fifties, where Lester cut the obligatory first piece of cake for the photographers while holding his horn in the other hand, playing I DIDN’T KNOW WHAT TIME IT WAS, both witty and apt. And I was cheered by the blogpost written by Fernando Ortiz de Urbina, where he states the heretical but resounding truth that Lester’s influence outweigh’s Charlie Parker’s. You should read it here: http://jazzofftherecord.blogspot.com/2009/08/lester-young.html — his blog, not incidentally, is named EASY DOES IT, in Lester’s honor. And as I write this, WKCR-FM is playing Lester’s music — for free — and it can be accessed online at http://www.wkcr.org. But I wonder how much posthumous affection and attention we would have to give Lester to make up for the hurts he suffered. His feelings, once wounded, stayed that way. His father threw him out of the family band because he couldn’t read music (although he played his part magnificently by ear); later, his section-mates in the 1934 Fletcher Henderson band mocked him because he didn’t sound like their idol Coleman Hawkins, and insisted that Fletcher get another tenor player; John Hammond discouraged Count Basie from raising Lester’s salary although Lester was that band’s star; he could not make a success of his own small band; the United States Army did its best to destroy him; a legion of “grey boys” played his phrases back to him in clubs and concerts for more money; he ended his days in New York, sitting by his window, playing mournful Frank Sinatra records, drinking cognac. It is no accident that some of his most unforgettable solos — BLUES IN THE DARK, I LEFT MY BABY, FINE AND MELLOW — sound like a heartbroken man trying to hold back tears. Can love that comes too late make up for its absence? I don’t think so.